Rain is taking its own time in approaching to various places in India. They Olympics is going on with some interesting records being established. The major power crisis in North India are a setback. So we need to get energized right? 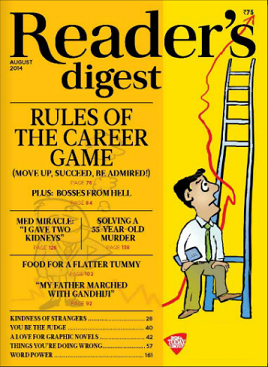 This issue of the Reader’s Digest – India comes in with the cover page saying “Energize Your Life” in a call out with yellow background. The entire cover page is in Pink (energizing) background. So let us dig into the content of the same to see whether it really brings us something which can recharge us?! There are quotes available but we found them less touchy then usually found in RD. GreenHeart – the regular column by Bittu Sahgal – editor of Sanctuary Asia magazine – brings us an article telling that every drop in the ocean counts. It is an article about Mahadev Rajaram Subrahmaniyam. A kid who got awareness about the environment and especially – the Save Tiger movement. He was very keen saving the tigers since. He started his bits like polishing shoes, working as the gatekeeper to his home and allowing the visitors to his parents in, only after collecting some stuff for his mission. At the age of 10 he have collected more than Rs. 1.5 lakhs for his “Save Tiger” mission!!! The kids like him are the source of inspiration for the adults too… who thinks “What can I do?” Really interesting tale, a recommended read. Right Here Right now section lets you realize that how integral is the association of the mobile phone became for us. It also brings in the information about the leaning buildings (in addition to the famous tower of Pisa of course). The facebook and mobile age made us using the emoticons (like 🙂 🙁 etc) in our routine life and the pronunciations of the same are being part of our vocabulary too. If you love to know more (and attending) about various cultural events, this section brings in the information about some of those events scheduled for the recent future (especially pipes, pantomimes and plays). This book closely looks at the minds of four different people and try analyzing their behavior in various situations. It is about how we occasionally have to wrestle with our conscience in situations where our loyalties to our family, friends etc. is at test. For example, the book have a character who enters the foreign country by entering false entry date in his legal papers, which will be dangerous for him – can be resulted into the death for him – if captured. Why does he do that then? This book is about how the protagonist who belongs to Kenya’s idealistic anti-corruption department got to know about and expose the massive corruption. It is quite straight forward book and like the film tale where you see hero is not giving up and fight against the odds till last. Read detailed reviews in the magazine to know more. Ask Laskas section have some interesting(!) questions. Well, they are the kind of questions which shows the human psychology and nature of thinking actually. The word power section this time brings in the word having just “U” as the only vowel via a quizzy stuff. If you are a language (or linguistic) lover, you will like it. Read the interview and you will realize how good this fellow is, at language. If you have heart then you can help. This is the motto of the section the kindness of the strangers. It shares the story of how an elder man from Arunachal Pradesh help a young couple of Punjab (in addition to two more such incidents). Actually, I love this section of the magazine the most, as it bring information about real heroes who helps other without any personal interest. Usain Bold is the famous name for the world record of conquering the 100 meters distance in just 9.69 seconds. A detailed story about this Jamaican sprinter is found inside the magazine. Quite inspirational. Michael Trapp was flying his two seater aircraft and… he was in the mid of the see where he had to survive for 18 hours till rescued! What made it happen? Read the Real-Life drama segment to know more. James Harrison is 77 year old man who is world’s most prolific blood donor. He came to know about blood donation stuff when he was 14. He needed to have a blood transfusion then. He then understand the importance of the blood donation and he have donated blood for around more than 1000 times now. And he has no plans to stop. He entered the Guinness book of world records in 2003. This Australian is worth to salute. Read the article to know more about him. The current advancement in the technologies have helped the human kind in various manners. Earlier when dictators were preventing media to expose the true condition inside their ruling area. The world is in black and blank about the same. Number of human rights were violated and no one was able to know the same. Now, it is all different. The technological advancement makes the stuff visible to the entire world. And sometimes it plays a vital role in the revolutionary movement. There is an article titled “The World Is Watching” about this stuff. Star Wars movie franchisee is so popular that the tickets of around 4.4 billion USD is sold till now for the same. Some memoirs for this franchisee are there in the issue with photographs. The movie lovers will like it for sure. An article about Meera Syal explores her abilities. She is not only a noted comedian, playwright but have other noted factors of her life are important to explore as well. When the Olympics is going on, the article about Novak Djokovic – a Tennis player, who set himself a challenge. He is determined to change the way the world sees his country. The article is aided with his childhood photo as well. An inspirational stuff. An article about Paris, brings you there for the tour you will love. May be it is a different way to look at Paris. Confessions of a serial dieter – is an article by Kalli Purie – given as a bonus read. She was 104kg. from which she is transformed to the slim figure. The article is nicely weaved with her photos, confessions and the excuses people make to avoid dieting (or exercising). The last page have the art-picture titled “Panch Parameshwar” – based on Lord Krishna. Overall a good read. Personal suggesion: go for it to get some inspirational tales.